This week I finished this baby quilt. And I bought five yards of fabric. I’ve wanted to make a houndstooth check quilt for a long time. I used this tutorial by Jenny at Missouri Star. It was very easy, but watch the pieced blocks. They’re all bias, so they’re very stretchy. When I sewed them to the plain blocks, I used pins, and sewed with the plain blocks on top to ease in any fullness. I’m very happy with the way it turned out. It in my Etsy shop. I hope you’re getting some sewing time! Categories: Finishes, Stash | Tags: houndstooth baby quilt, pink and gray baby quilt, pink and gray houndstooth | Permalink. And another one! It never rains but it pours, and I have another commission. This little Jedi will get rose colored applique. Terrible weather during the past week, so lots of sewing got done! And no new fabric. Yet. 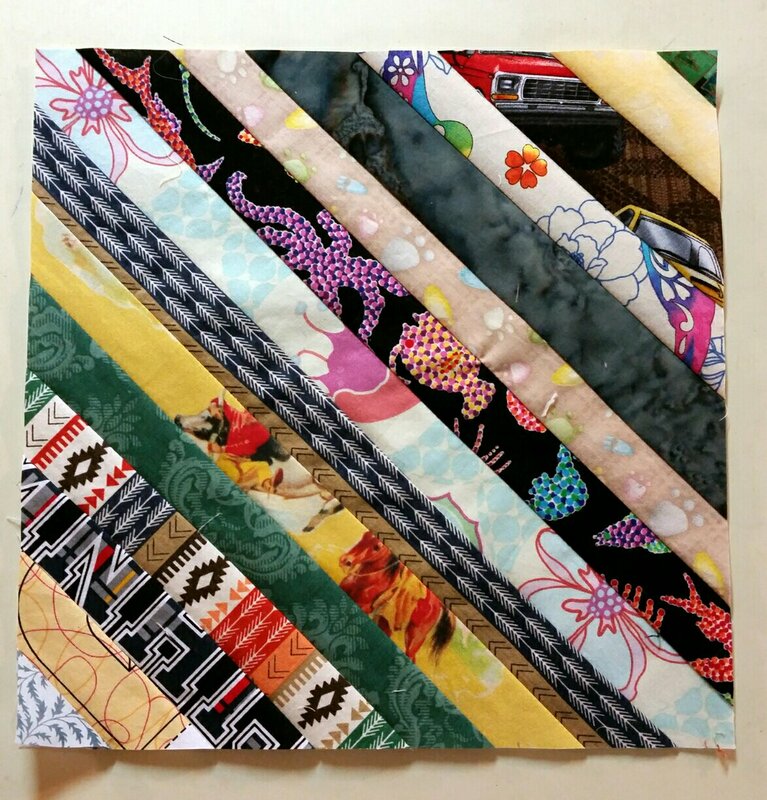 This baby quilt was inspired by some of the fabric I got on sale after Christmas. The two fabrics are not related, but I thought they belonged together. Find this in my Etsy shop. This quilt looks familiar, but I just finished it as a custom order. This makes # 12 of my elephant/Star Wars baby quilts using this design. So that’s seven yards used this week. Almost breaking even! Good luck on your destashing! Categories: Finishes, Stash | Tags: elephant baby quilt, jungle baby quilt, safari baby quilt, star wars baby quilt, zoo baby quilt | Permalink. Instead of a quilt top on my wall today, I have a “finished” quilt from 2007. 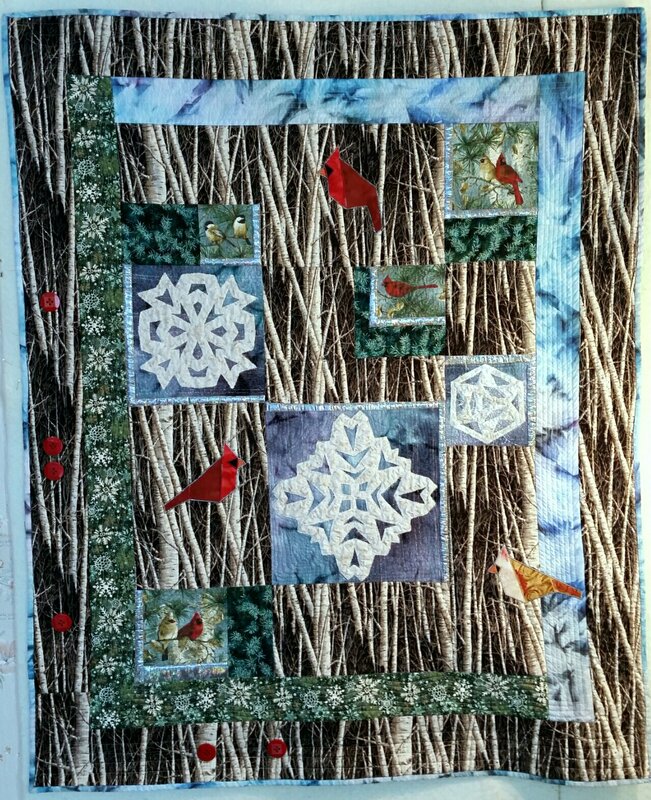 I liked the birch fabric and the interesting ways I added sparkle to the snowflakes, but it was never right. Up close, the printed cardinals are colorful and interesting, but they don’t show up from any distance away. At some point I added the red buttons. 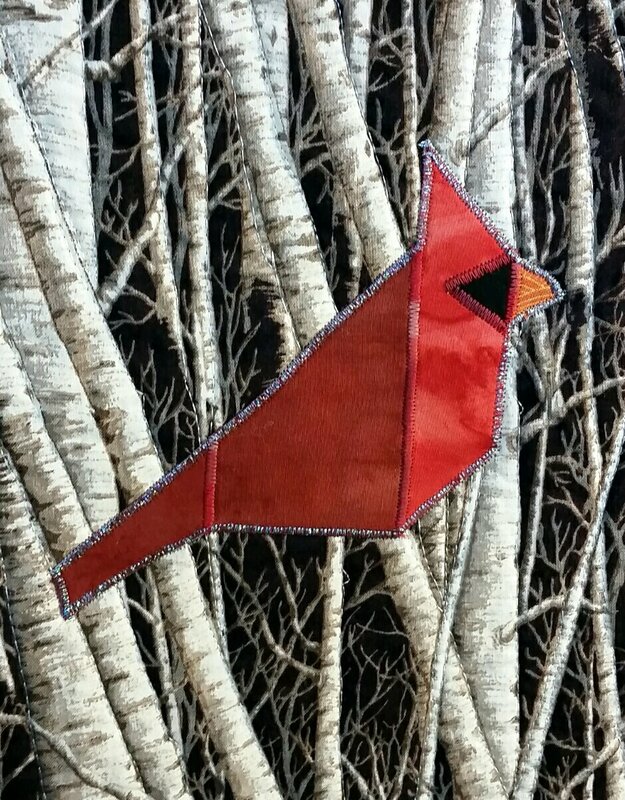 Yesterday and today I added three applique cardinals. This is a paper pieced pattern from Debby Krativil, but I used it for applique. I changed the tail on one of them. I satin stitched them to the quilt using a Sulky gray metallic thread to continue the glittery theme. What do think, is this finally finished? I’m pretty happy with it. My finishes this week were eighteen of these lovelies for Kat’s Jan/Feb block drive. Still loads of time if you want to lighten your string bin(s)! I’m always amazed by how much better they look when they’re trimmed up. They’ve been packaged, addressed, and are in the riding-around-in-my-car stage of reaching Kat. And, no new fabric was purchased. I’ll get there! The other sewing I did was the first clue to Summer Stars at Fawn Lake. Again, still time to join us in this mystery quilt. Good luck using your stash!